PORT ELIZABETH, South Africa, July 9, 2010 (AFP) - Germany striker Mirsolav Klose will decide if he is fit enough to face Uruguay in Saturday's World Cup third-place clash, with the all-time tournament goals record within reach. Klose has been suffering from a back injury, a setback that has put a cloud over the 32-year-old's hopes of grabbing two more goals to surpass the World Cup record of 15 held by Brazil's Ronaldo. "It's Miro who will decide if he feels better and if he can start," said assistant coach Hansi Flick, who stood in at Friday's pre-match news conference while coach Joachim Loew was laid low by flu. "He can go down in history if he scores one or two goals. The whole team wants to help him do it." Like Loew, captain Philipp Lahm and striker Lukas Podolski have been suffering from flu and are also in doubt for Saturday's game. "We will decide in the morning if they will play," said Flick. Germany were forced into the play-off when they lost 1-0 to Spain in the semi-finals, while Uruguay went down 3-2 to Holland in their last-four game. Flick insisted that the team's motivation has not been affected by failing to reach Sunday's final. "Of course, we came to South Africa to be world champions but we want to show in this match what we are capable of. Third place is our minimum target and the match allows us to finish on a postive note," he said. "We are facing a Uruguayan side who are hard to unsettle but we have shown against England and Argentina that the players are not frightened by this task. "Despite our defeat to Spain, this World Cup has been a success." 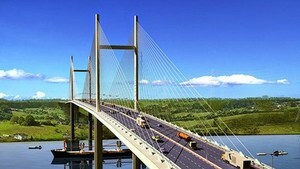 Deputy Chairman of the Ho Chi Minh City People’s Committee Tran Vinh Tuyen, Deputy Chairman of People’s Committee of Dong Nai province Tran Van Vinh and leaders of departments and agencies of the two localities yesterday afternoon had a meeting about Cat Lai Bridge construction project connecting Ho Chi Minh City and Dong Nai province.